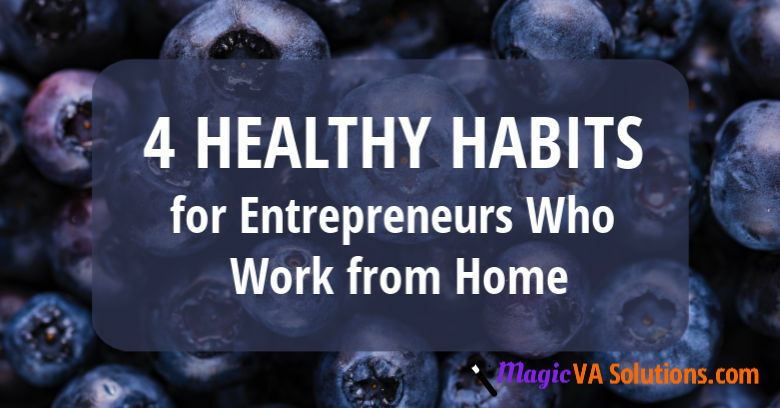 For entrepreneurs who work from home, doing the right thing for one’s health can be a real challenge. Read on to learn how you can fit some healthy habits into your work-from-home lifestyle. Get up and move around every so often. Studies have linked long periods of sitting with Type 2 diabetes, cancer, obesity and premature death. Exercise regularly. Exercise isn’t just for weight control; it also releases endorphins, so it lifts our mood and it can be an excellent opportunity to ‘zone out’ and get our creative ideas flowing. Drink lots of water. Our brain is made up of 73% water. If we are only a little bit dehydrated, it affects our mood, cognitive and motor skills and memory. As knowledge workers, having our brains working at their best is vital. Eat healthily and limit the junk food. By eating well, we reduce the risk of Type 2 diabetes, heart disease and some cancers. We keep our weight under control, and our bones and teeth all benefit. So, how do we incorporate more healthy habits into our day? I struggle with this also, but I have found a few things that work for me – when I’m being good; let’s not talk about the bad days! Taking regular breaks and moving around can be achieved if you use the Pomodoro Technique. I use a website called Tomato Timer. I set the timer for 25 minutes, do some work at my computer, and then when the timer goes off, I set it again for 5 minutes, get up and do something around the house, like hanging out the washing or emptying the dishwasher. Repeat that for as many times as you wish, with a longer break for lunch. To make it fun and add some extra productivity to your day, make a game of it to see how many ‘Pomodoros’ you can fit into your day. Have an exercise buddy – this makes you accountable. My buddy is my son; I think three years ago is when he gained the endurance to join me on my walks without complaining, and he’s been out walking with me every day since. Put your workout clothes/runners out the night before – make it easy for you to get started in the morning. Exercise in the morning – it starts your day off right and then you don’t have to think about it again for the rest of the day. Have a contingency plan for when you can’t do your usual exercise routine – raining out and can’t do your usual walk? Do some Zumba in front of the TV. I’m planning to set up a couple of steps in the garage, so I can revert to my twenties when I enjoyed doing step aerobics. Mix it up a bit – it’s easy to get bored of the same old routine, so try some new forms of exercise; try weight training, jump rope, rebounding or bicycle riding. Sometimes, changing your environment does the trick. If walking or jogging is your thing, try a different route than usual, or if you usually walk in a circuit, walk in the opposite direction. It’s amazing the things you notice when you approach from a different perspective! 5-4-3-2-1 – And if all else fails, and you’re tempted to turn off the alarm and go back to sleep, take some advice from Mel Robbins. Just count backwards from five and get yourself moving when you get to one. You can keep yourself well hydrated throughout the day if you have a 1-litre jug available that you fill up at least twice. You know you’ve done 2 litres if you’ve managed to drink two jugs’ worth. Add a slice of lemon to flavour it slightly. The thing I don’t like about drinking cold water is that here in the tropics, the water always condenses down the side of the glass, ending in a pool on my desk. To overcome this, I use a large thermal coffee cup, which keeps my water cold, but doesn’t allow the water to condense. Mine’s 483 ml, so I drink about 4 of these each day. Diet is a huge topic in itself, so I won’t cover it here, but I will share with you two tips and a few ideas for healthy snacks. Tip #1 – Don’t have junk food in the house. If you feel like eating something that’s not so healthy on the weekend, make sure you don’t buy/make so much that it’s still hanging around during your work week. Tip #2 – If you’re in charge of making lunches for the kids in the morning, take that time to make yourself a healthy lunch for later. When lunchtime rolls around, a salad will seem more appealing if it’s already made and waiting for you. 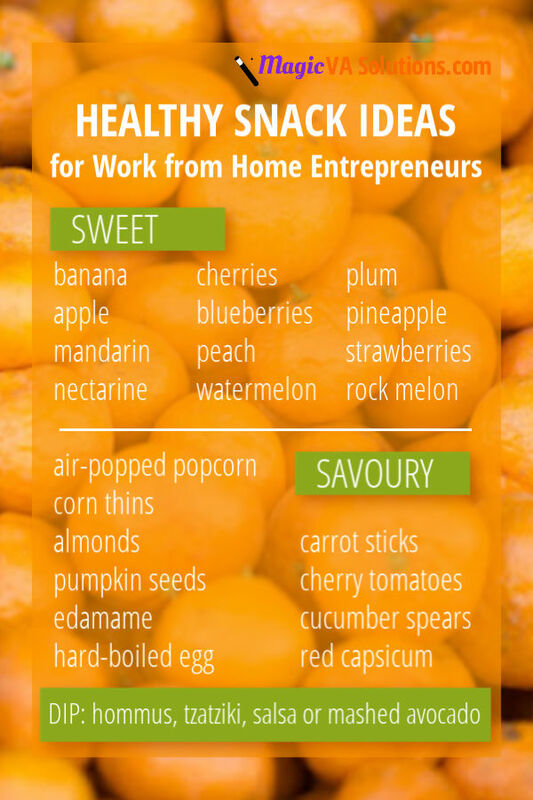 And finally, here are some ideas for healthy snacks for when your Pomodoro timer’s gone off and you’re raiding the pantry for a snack. Better yet, prepare your snacks ahead of time, so you don’t have to go looking for them when you’re at your hungriest! In summary, working from home can sometimes negatively affect our health, but it doesn’t have to. With some planning ahead, and making healthy habits easy, the right choice can be the obvious choice. By establishing the habits of getting up and moving around every so often, exercising regularly, drinking water and choosing nutritious snacks, we can reduce this risk of lifestyle-related disease, keep our brains functioning at their optimum, whilst lifting mood and fostering creativity and productivity. It sounds pretty good to me! This article is not intended as a substitute for professional medical advice. Always check with your doctor before changing your diet or starting a new fitness routine. “How Your Habits Shape Your Identity (and Vice Versa).” ATOMIC HABITS, by JAMES CLEAR, RANDOM HOUSE BUSINESS, 2017, p. 33.